DIGI+ Talent Accelerator & Jumpstart Program (hereinafter referred to as “DIGI+ Talent program”), promoted by the Industrial Development Bureau of the Ministry of Economic Affairs, defeated competitors from around the world and won the 2018 ATD Innovation in Talent Development Award on May 8, EST. ATD Innovation in Talent Development Award is given to organization recognized for being innovative in talent development and has a positive impact around the globe. The nominees will be judged by the expert committee carefully. Every year, only one or two finalists would be selected from around the world; therefore, this award is also known as the “Oscar” in global talent development. This year, this highest honor of ATD goes to Taiwan for the first time. “The industries of Taiwan are actively promoting digital transformation. All sectors have a great demand for digital talents in fields like artificial intelligence, data science, IoT, Fintech, intelligent content like AR/VR, and so on. The traditional model of talent trainings cannot meet the demands for industry professionals and pace of innovation,” said Lu Zheng-Hua, the Director of Industrial Development Bureau. “DIGI+ Talent program marks the first time that the Industrial Development Bureau of the Ministry of Economic Affairs adopted an innovative mode to open up advanced technology and resources of research institutes to college students by providing internships. 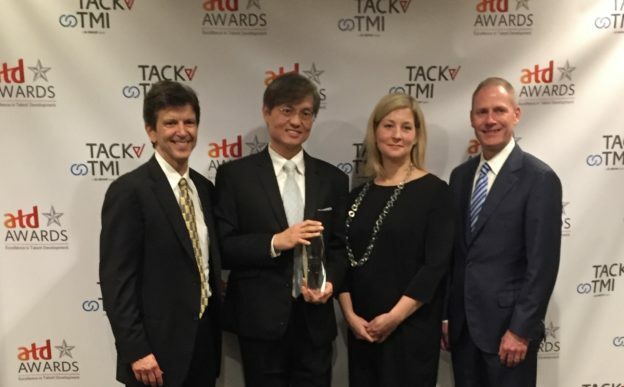 This time, 2018 ATD Innovation in Talent Development Award recognized Taiwan’s vigor of innovation in cultivating industrial talents around the world,” Director Lu remarked. “The program promoted by the Taiwanese government makes full use of the blended model of online and offline learning. The committee is impressed with Taiwan’s energy of talent cultivation and spirit of innovation,” Tony Bingham, the President and CEO of ATD, particularly underscored.